Annealed Steel Wire, mostly written as soft annealed wire, annealed iron wire or just annealed wire.This kind of steel wire offers excellent flexibility and softness due to its oxygen free annealing process. 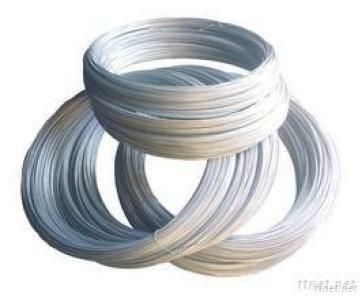 We offer three types of soft annealed or hard basic wire: bright, black, and galvanized. These three wires areavailable in sizes ranging from .008" through .250", and can be put up on coils, spools, covered, orstraightened and cut. Dark Annealed Wire when produced correctly is black in color. It is for this reason display makers, auto repair shops, elevator repair shops, landscapers, wreath makers,builders, christmas tree farms, etc, etc, prefer to use our "invisible" wire. Paramount Wire's dark annealed wire is available on spools ranging from 10 yards to 500 lbs. Our dark wire is also perfect tie wire, available in coils of any weight, or straightned and cut from 1" to 144".